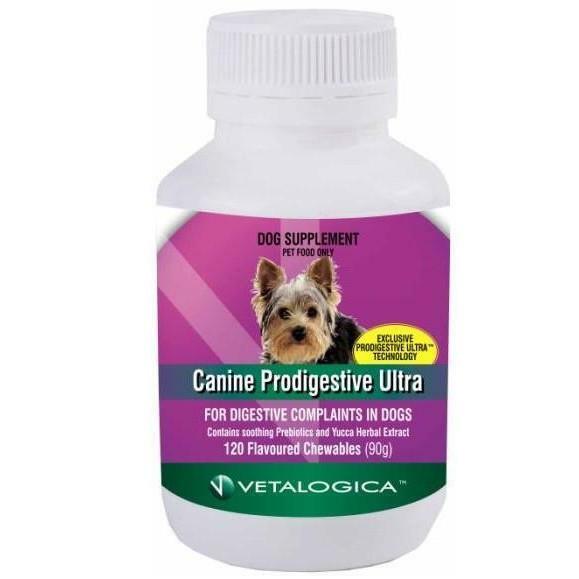 Vetalogica Canine Prodigestive Ultra 120 Chew contains Prebiotics and synergistic ingredients for maximum therapeutic effect. Canine Prodigestive Ultra contains Prebiotics and synergistic ingredients for maximum therapeutic effect. These Scientifically formulated chewable tablets, are proudly Australian Made and Owned. Extensive research and development by Pharmacists, Nutritionists, Veterinarians and Flavour experts have created a unique and therapeutic chewable tablet which is conveniently given as a treat to dogs. Up to 10kg: 3 Chewables/day. Real Australian Meat (Poultry Meal and Duck Meal), Vegetables and Vegetable Meals (Including Potato, Field Peas, Carrots, Pumpkin), Potato and Tapioca Starch, Oils (Poultry and Vegetable), Beet Pulp, Natural Flavours, Egg Powder, Oilseeds (Canola and Linseed), Humectants, Potassium Sorbate, Mannanoligosaccharides, Salt, Potassium Chloride, Vitamins (Retinol (Vit A), Thiamine (Vit B1), Riboflavin (Vit B2), Niacin (Vit B3), Calcium Pantothenate (Vit B5), Pyridoxine (Vit B6), Folic Acid (Vit B9), Cobalamin (Vit B12), Vitamin D, Vitamin E), Minerals (Calcium, Phosphorus, Iron, Zinc, Copper, Manganese, Iodine, Selenium), Kelp Meal, Garlic Powder, Yucca Schidigera Extract, Dried Chicory Root, Choline Chloride, Soy Lecithin Powder, Tomato Powder, Green Tea, Rosemary, Mint.